Lassi's parents are FI CH SE CH Neatut Kadluk KVK1 REK1 "Jyry" ja FI CH NordJW-09 Cahppes Miss Qrendi KVK1 REK1 "Yona". 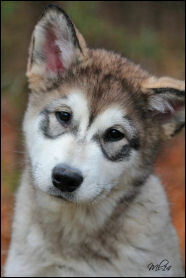 At first we weren't thought about having male puppy from that litter, our plans was to leave only one female puppy, but Lassi decided otherwise and "sold" himself to us! Lassi is very energetic when needed, but in a same time he is calm and takes contact towards people and he seems to be smiling all the time. We have high hopes for him at the future and we hope he could be as good leader as his mom Yona and dad Jyry. But future tells us more. 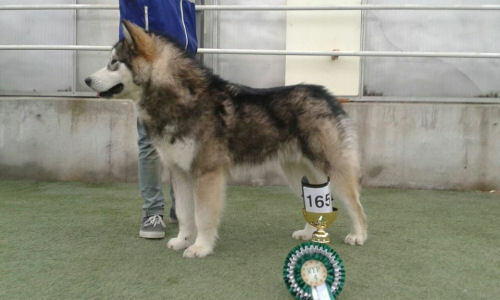 Lassi has also very promising structure and in Kouvola puppy show 8.3.2015 he was BOB-puppy and also Group4! Lassi's first official working result came from Ruunaa Race 2016 in MD4-class. Distance was 3 x 32,5 km = 97,5 km and result was REK3. Lassi has also ran Eastpoint Open 100 km (diminished in 75 km because trail condition) race in 6-dog class in Feb 2016. 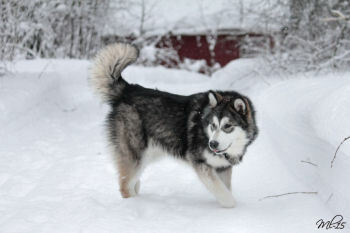 In 2017 Lassi got his first KVK1-results from Alaskan Malamutes official weight pull tests. Lassi has also attended to FWPA's weight pull competition in season 2017 with good results.